The cafeteria at Detroit Public Schools’ Thirkell Elementary may be the quietest in the state. It certainly is the quietest school cafeteria I have ever visited. On a school day in early June, parent volunteers and teachers milled among students, who spoke quietly to one another while eating lunch. This is just a small example of the educational environment at Thirkell. Throughout the day, staff members and students treat one another with respect. Parents, teachers and students all say that the warm atmosphere and focus on student learning at Thirkell is due to the leadership from Dr. Clara Smith, the school’s principal. “She is a great leader,” said Shailiaja Pritchett, a parent and school volunteer. “She demands excellence from everybody.” Indeed, Smith’s office walls are covered with awards, photos and thank-you cards from parents and community members. With the recent release of the Mackinac Center’s Elementary and Middle School Report Card, parent and teacher accolades are confirmed: Thirkell was the top-ranked school in the state of Michigan. The Center’s report card provides parents, policymakers and the general public with a simple way to accurately compare the performance of schools throughout the state. By capturing the socioeconomic background of students as well as test scores, the study is a better measurement for schools’ realworld effectiveness than state reports. In early July, I joined the Mackinac Center and former Detroit Public Schools Emergency Manager Roy Roberts to honor the eight DPS schools that were ranked among the top 100 elementary and middle schools on the Center’s report card. While it is true that the district is struggling as a whole — DPS scored below average — these schools are bright spots of sustained success. I’ll admit that it is hard not to linger on the public school failures in our state. After all, nearly 50 Michigan school districts are in a spending crisis. Most egregiously, the Pontiac School District spends more than $16,000 per student,and yet has difficulty providing toilet paper in school bathrooms, let alone an appropriate learning environment. As the Center has highlighted in the past, other school districts have mocked merit pay for teachers, or have refused to enroll students who are in need of better educational options. Yet we cannot ignore positive change. These schools face daunting challenges, and have managed to produce impressive results. Taking a closer look at successful schools can reveal education policies and practices that have enabled them to thrive. DPS adopted this policy in 2012 as a result of legislative changes to the teacher tenure law. These state reforms allow school leaders to make personnel decisions based on teacher quality – rather than seniority. Smith also noted that her school’s focus on discipline and respect allows teachers to spend more time teaching and less time disciplining students. She says that this focus ensures that students are “ready and willing to learn.” While Thirkell’s emphasis on discipline is not something that should be legislated, other schools could look to these practices as a model to follow. Lastly, Thirkell enjoys a level of autonomy that most conventional schools do not. DPS spokesman Steve Wasko told me that the district now allows successful schools more flexibility, including the ability to expand. Thirkell will be expanding to enroll sixth graders next year, and fifth graders are especially happy about this change. Keith Hightower, a fifth grader, said that his mother was happy he could enroll again because his grades have been improving during the years he has spent at Thirkell. Sonia Carter, a longtime parent volunteer, told me that the parents are “very happy” about the change. In addition to helping identify truly successful schools, the Center’s report card provides clear and intelligible rankings that do not penalize schools for educating needy students. We take student background into account by using the percentage of students at a school who qualify for a federally subsidized free lunch to predict test scores, and then grade the schools by whether their students did better or worse than expected. Four years’ worth of MEAP test scores in all subjects for grades three through eight were used to calculate a school’s score. By taking student family background into account, the Mackinac Center’s report card enables parents to compare schools, helps school officials assess school performance and provides policymakers with school rankings that measure real educational success. A school’s “Context and Performance score” indicates how far above or below projections an elementary or middle school performed, given its student population’s socioeconomic status, with 100 set as the average. The full report card and searchable database is available online at www.mackinac.org/CAP2013. Accurately measuring school performance is becoming increasingly important in Michigan. School rankings are now used to identify schools for mandatory reform, which can include replacing the school principal. Legislators are also considering expanding the statewide Education Achievement Authority, and proposed legislation would determine which schools would be taken over by the EAA. At Thirkell, almost 90 percent of students are from low-income families, yet students consistently score above the state average on MEAP tests. Adjusting for student background makes Thirkell’s success even clearer, with a CAP score of 137. In stark contrast, the state’s Top-to-Bottom ranking places Thirkell in the bottom 2 percent of Michigan schools. 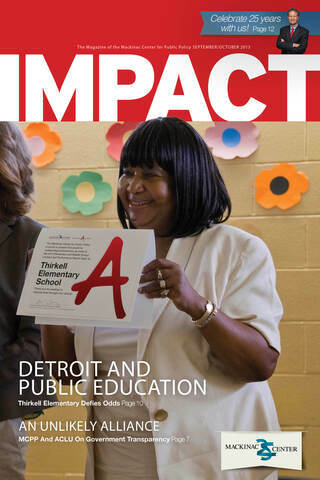 It is difficult to square the state’s low ranking with the school’s academic performance, parent satisfaction and high marks on other repor cards, including one published by Excellent Schools Detroit. “I have children who go to other DPS schools,” said Shailaija Jackson, a parent volunteer. “I have had a million schools try to steal me. But I like to be here because I fell in love with the dedication from Dr. Smith.” Jackson spends most days volunteering at Thirkell with other parents, and has been doing so for the past nine years. The nine EAA elementary and middle schools included in this report cardwere among the lowest-scoring schools. All nine received F’s, and Burns Elementary-Middle School,formerly a DPS school, was the lowest-ranked school in the state. Since MEAP tests are administered in the fall, the low scores of EAA schools likely do not reflect the reform district’s performance, but rather the performance of the schools prior to takeover. Similarly, schools in the Muskegon Heights and Highland Park school districts posted very low scores. Both districts were converted to charter districts this year, and their low scores are also likely due to past erformance. However, whenthe Center re-publishes this report, special attention will be paid to whether school scores change over time. Careful steps will need to be taken so that state school reform efforts do not include the takeover of successful schools (like Thirkell) that serve needy students. As reform efforts move forward, the Center will watch to help ensure that a serious error is not made. But for now, we are proud to honor educational success, wherever it may occur. Teachers, parents and administrators at Thirkell are changing lives, and we hope that struggling Detroit-area schools follow their example.